The 2018 Ole Brook Pro Rodeo is coming to the Lincoln Civic Center on May 11th-12th. The festivities will begin on Friday night and the gates open at 5 p.m. Tickets are $15 at the gate and $12 in advance. Kids 5 and under are free. The event will feature Dusti Crain-Dickerson, a performer from Dixie Stampede. This rodeo is part of the Wanted Dead or Alive Rodeo Tour! 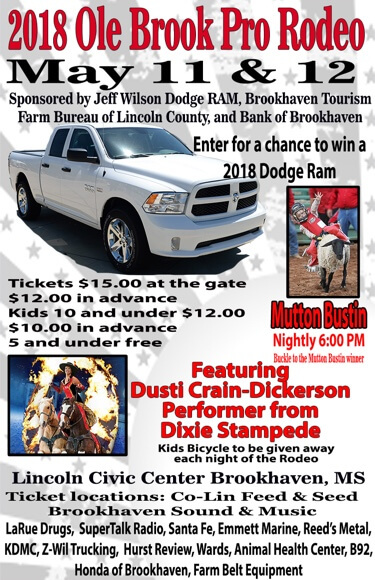 Each night will be Mutton Bustin at 6:00 p.m. and a kid’s bicycle will be given away! There will also be a drawing for a chance to win a 2018 Dodge Ram. Don’t miss out on this exciting weekend in Brookhaven, Mississippi!